More than 160 people were killed across Syria on Saturday as Russia and the Assad regime bombed before a ceasefire takes effect tomorrow evening. The pro-opposition Local Coordination Committees reported that the victims included 32 children and 24 women. 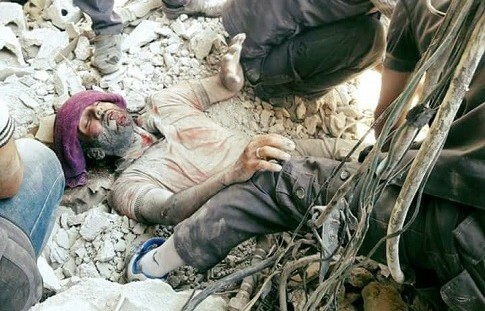 Of the deaths, 57 were in Idlib Province, amid pro-Assad airstrikes on a marketplace in Idlib city. The toll is expected to rise, given that some of the injured are in critical condition. Another 56 people died in Aleppo Province, with airstrikes on Batbo, Salhin, and Kafrnaha. There were 16 killed in Hama Province, and 15 in Daraa Province. Early Saturday, Russia and the US announced that a ceasefire will begin on Monday at sundown, the beginning of the Muslim holiday of Eid al-Adha. The “genuine reduction of violence” is supposed to allow aid to parts of Syria’s largest city Aleppo and besieged towns, although the opposition and rebels are sceptical that Russia and the Assad regime will control access to restrict assistance to opposition districts. If the ceasefire holds, the US will begin sharing intelligence with Russia for targeting of airstrikes. Purportedly, this will be for attacks on the Islamic State and the jihadists of Jabhat Fatah al-Sham, formerly Jabhat al-Nusra. However, Russia has used the pretext of focus on ISIS and Nusra to cover thousands of strikes on opposition territory since last September. Moscow has prepared for further attacks by saying that rebels must be “separated” from JFS/Nusra or face bombing. The US maintains that, under the agreement, Russia will only attack in designated zones. Washington also says that Moscow will ensure that the regime air force does not bomb other areas controlled by the opposition. The opposition High Negotiations Committee said on Saturday that it has yet to receive the agreement. Earlier, HNC member Basma Kodmani said the committee “cautiously welcomed” the deal but was sceptical that the Assad regime would comply. No rebel group has supported the initiative. The jihadist Jabhat Fatah al-Sham, formerly Jabhat al-Nusra, has blamed the US for the airstrike that killed its commander in Aleppo Province, Abu Omar Saraqeb, on Thursday night. The stances of the United States towards the Syrian revolution has proven to the world that they are not concerned with the humanitarian situation in Syria nor towards the revolution, but driven solely by self-interest. JFS said Washington’s “alliance with Russia…is cogent evidence that they fiercely oppose the notion of independence for the Syrian people”. It said the US-Russian plan for a ceasefire is “a deceptive plan which is disgracefully taking advantage of the humanitarian situation”. On Friday, the Pentagon denied US involvement in the raid that also seriously wounded another JFS commander, Abu Mousa al-Shami. A US defense official pointed towards Russia as the attacker. Reports indicate rebels have advanced farther in their offensive across northern Hama Province, capturing the village of Kawkab. Rebels had surged at their outset of the offensive at the end of August, taking four towns and a series of villages and moving within 10 km (6 miles) of Hama city. However, the advance was checked at the fortified village of Ma’an more than a week ago, as the pro-Assad advance near Aleppo — reimposing a siege on opposition areas — took over the headlines. The leading rebel faction Ahrar al-Sham has posted its casualty figures in the conflict: 7,805 killed; 1,045 wounded and permanently unable to return to battle; and 120 taken captive.